But then Oskar told me he wanted to make it a special tasting and that he’ll take care of the bottles. I could easily live with that, and laid back in awaitance of some decent wines. But when he handed over the bottles some days before the tasting I couldn’t believe my eyes. 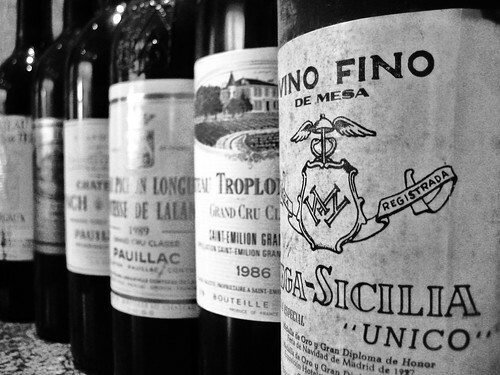 Half of those wines were legends: renowned Grand Crus’ from great years in Bordeaux, plus a very rare and special Spanish wine! Of course, when the day came, I tried hard to prepare a worthy meal to match those wines. I opened all the bottles In the late afternoon and nearly jumped for joy when I realized that none seemed to have a sign of flaw. All the corks came out easily, even though 2 broke in the process. As for decanting, I chose not to take the risk and opted for leaving them in the opened bottles. Despite the respect one could have for such wines, I followed the protocol of a blind tasting and covered up all the bottles, mixed them and provided them with numbers. I have to admit in front though, that I recognized the last wine from the bottleneck since it was made of frosted glass. Here are my notes on the wines in order of tasting. 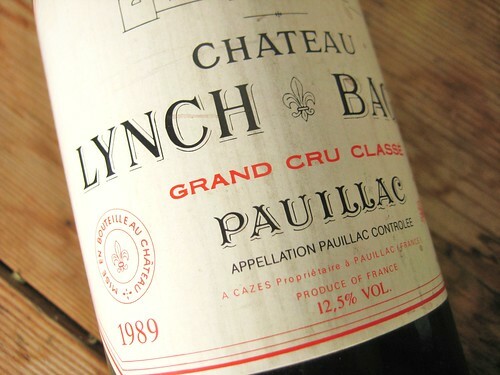 1989 Château Lynch-Bages, Pauillac, 2ème GCC. What a start into this tasting! First of all: any description of the vintages 1989 and 1990 other than “mythical”would be understatement. Second, this is one of the big names in Pauillac, and at the same time alleged to be one of the better achievements within this great vintage. As for the factual background: it is composed of 73% Cabernet, 15% Merlot, 10% Cabernet Franc and 2% Petit Verdot; the wines are maturing in 70% new French oak barrels. My excitement was already confirmed and even aggravated when I pulled out the cork in the afternoon: it dispersed the most appealing perfume of ripe black currant; I nearly had to bite into it. Of course I would already have been happy discovering that the wine didn’t show any signs of a flaw. In the evening when the wine was poured, we were instantly amazed by an impressive brilliance of the robe. Also the colour was dark with only the tiniest orange-brown hue on the side. On the palate it was litteraly taking your breath away. More like a concentrate of wine than wine. It is a rather muscular with lots of power and showing intense aroma of dark berries mixed with leather and spices. Texture-wise it felt viscid and silky at the same time and the impression of depth and complexity quickly emerged. But this wine was very much alive and thus developed while we drank it, tannins came back through and signalized that the wine has enough structure to run for another decade at least. Talking about structure, acidity had a very precise touch, giving just as much backup to the wine to be able to run this magic show. But also new aromatic impressions came up after some time with a slight meat touch and a hint of the most subtle vanilla. The finish is introduced with a superb malty sweetness and lasts at least 40 seconds with all the aromatic amplitude of this wine. Very impressive! Parker scored this wine 95 points (René Gabriel gave 19 points out of 20) some years ago and I can only agree. I most probably would even add a point or 2 and a “plus” for further potential. In the end I believe that this wine really would have required a proper decant instead of the 3 hours in an open bottle I have granted to “old wines”. But no regrets, this was a great experience! 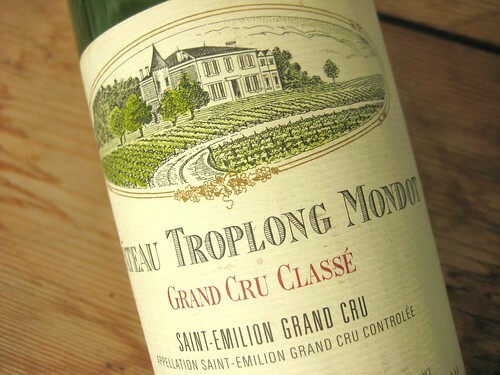 1986 Château Troplong-Mondot, Saint-Émilion, 1er GCC B. Coming from Saint-Emilion, this is of course a Merlot wine as opposed to the Médocs which are long on Cabernet. The vineyards of Troplong-Mondot are located on the highest point of Saint-Émilion and thus benefite from perfect natural drainage.Interestingly, this estate has been promoted to 1er GCC B rank in 2006 when the system was revised for the last time. In the glass the wine showed a much darker colour even than the first wine, however also with a slight orange hue. The nose appeared rather one-dimensional at the beginning (especially in comparison with the first wine), also with a somewhat alcoholic or glue-like tone biting a little bit into the olfactory nerves. Underneath certainly red berries, but rather to be guessed at first. With time though, the berry flavours became much fuller, muting towards darker fruit and with a sweet edge to it. On the palate the first conclusion is that the wine still has a lot of power, but which is also linked to a rather harsh finish with burning alcohol. Otherwise there is some nice spice on the palate, but also some bitterness. Acidity doesn’t feel as precise, rather broad ans also a little sour. Finish has a satisfying length, but is far from the monumental finishes of other wines in this tasting. In the end, this was one of the less interesting wines of the tasting. But this shouldn’t be so surprising since 1986 was a rather weak vintage in St-Émilion (according to wineterminator for example). Having said that, I still believe it is a solid wine, nicely drinkable, without any sign of age and with good weight. 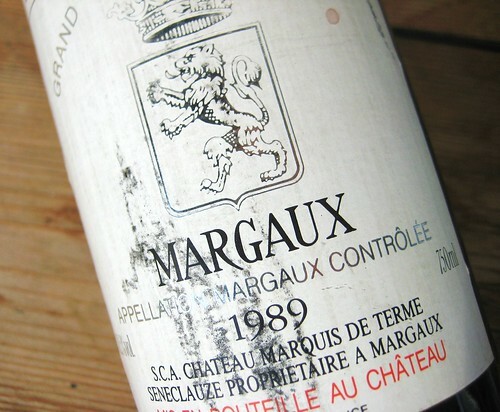 1989 Marquis de Terme, Margaux, 4eme GCC. This Margaux comes with 35% Merlot besides the 55% Cabernet and thus suggesting it’ll be much fruitier and mellower than wines from Pauillacs. Fruit is also supported by another 3% of Cabernet Franc and countered by 7% Petit Verdot. This third wine displayed the youngest colour of the tasting until now, very dark and slightly transparent to the side. The nose was very much on sweet fruit with hints of marzipan also a bit later. On the next day, it was clearly into the red fruit direction with red currant gelée scent, but also with a cloud of toasted bread or pumpernickel in it. On the palate it presented itself as a very compact wine with a nice fruit edge. Red currant and a touch of marzipan were also discernable here. Indeed, this wine appears very linear from nose to finish, without any flaws. The finish was also on the red currant fruit, with a good 20 second length. This was a nice wine. Not overly complex, but juicy and fruity with no signs of age, showing that 1989 was a good vintage all over the place where even smaller estates can be solid values. Similar to the Troplong-Mondot, but with a little more delicousness I’d say, more of a crowd pleaser. Definitely worth around 90 points. 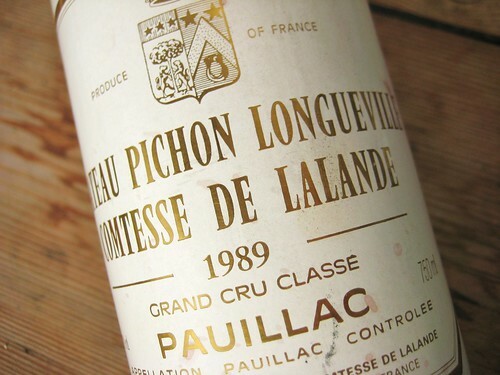 1989 Château Pichon Longueville Comtesse de Lalande, Pauillac, 2eme GCC . Again a great Château from Pauillac! Alone the very fact that its vineyards are right next to those of Château Latour makes it interesting. But as opposed to Latour and all other Châteaux’ of Pauillac, the Comtesse is known for its uniquely low 45% of Cabernet. In fact 35% of Merlot and 12% of Cabernet Franc account for a more supple wine with 8% Petit Verdot remaining to give some structure and strength. Another particularity is that 11 hectares of their vines are located in the St-Julien area, with a Terroir known for very perfumed wines. Colour of the wine was rather dark and went more in the ruby red direction. The nose was a bit puzzling at first, with a slight stinky element that some of us wrongly identified as being cork. For me it was more of a horsestable tone which added personality. Anyhow, it diminished with time and was replaced with a delicate forest smell. Later some more precise fruit notes of fragile wild raspberries and maybe a hint of Marzipan also showed through. On the palate, the horsestable tone was also there but soon as well transformed into forest and mushroom flavours. Fruit was less precisely defined in this wine, or maybe just more fragile and discrete and showed mostly on the back-palate and in the finish with delicate red berries. 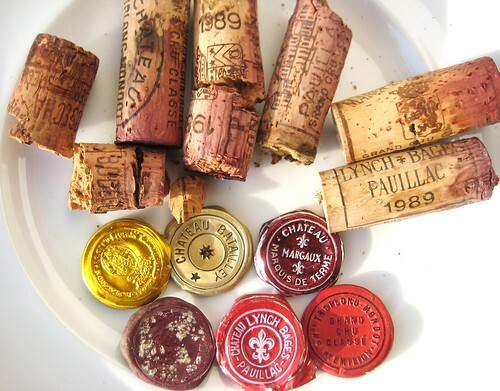 The structure was a bit less convincing, or maybe contrasted too much with the other wines: one could have the impression the wine felt a little shallow or watery on the palate in comparison to Lynch-Bages. Well, it definitely doesn’t have the same kind of tannic backbone and is a much less muscular wine. As for the watery, this impression was very much triggered by a feel of freshness with eucalyptus tones that reached far into the finish. But texture-wise those re-appeared tannins were mellow and powder-like, felt rather eucalyptus-like fresh, and lead into a harmonious and gentle finish with tiny cells of berry and maltose sweetness. And it was also unbelievably long-lasting with at least 30 seconds. Delicious finish! This is definitely a more feminine wine than Lynch Bages and with a very elegant appearance. It is beautiful and delicious to drink and worth 92-94 points. 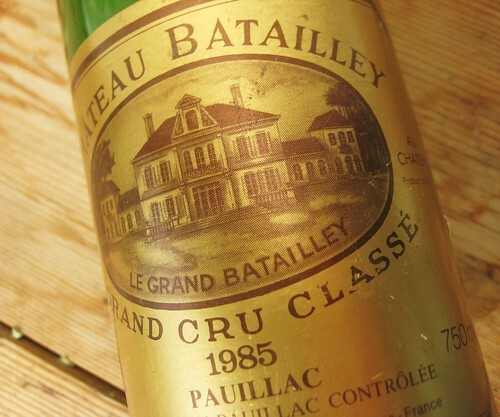 1985 Chateau Batailley, Pauillac, 5eme GCC. Now we’re Back to the kind of Pauillacs where Cabernet is King with 70% of Cab, 25% of Merlot and 5% of Cabernet Franc in this fifth Grand Cru Classé. It is located a bit further from the Gironde River than the 1er GCC’s and vineyards surrounded by woods already. The 1985 vintage was one of the better but still far away from legends like 1989 or 1990. Colour is a little pale and not as brilliant as all the other wines. But still, this wine instantly convinced with an intensely perfumed nose of white pepper as well as fresh and complex notes of black tea and later also some hints of mushroom. Underneath those layers some nice sweet berry fruit was suggested but in a not really distinct way. What a nose! Somehow intense, complex and delicate at the same time – probably my favorite of the tasting, although it is hard to say since there were 3 wines with superb nose but each with a different appealing personality. On the palate the show went on. White pepper, sweet maltose, then also some berries joined the party. Only the acidity didn’t fit so well in the picture, being a little plump and sour. Also from time to time a slight age tone surfaced, not being bothering but definitely depicting a quality difference to Lynch Bages 1989. The finish though is very nice, clearly on black berries and with a 20 to 30 seconds length that puts a smile on one’s face. Ultimately this was a wine with brilliant nose, deeply complex-as if it wanted to show you what kind of fantastic things your nose is capable of smelling- but with a palate showing also some imperfections. In the sum though: great personality! A 93-95 points experience for me. And even if 1985 is presumably not as long lasting as 1989, I wouldn’t hesitate to pick a bottle of this one in the future. 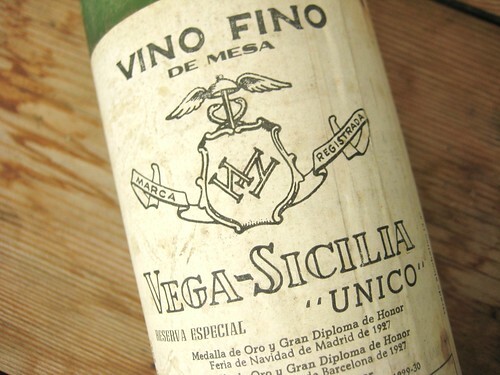 Vega Sicilia Unico Reserva Especial 1980 bottling. What an excitement when I saw that this very special wine was among the contestants, playing the role of pirate bottle. I first looked for a vintage on the label (usually there is written Cosecha in broad letters somewhere) but could only read it was bottled in 1980. 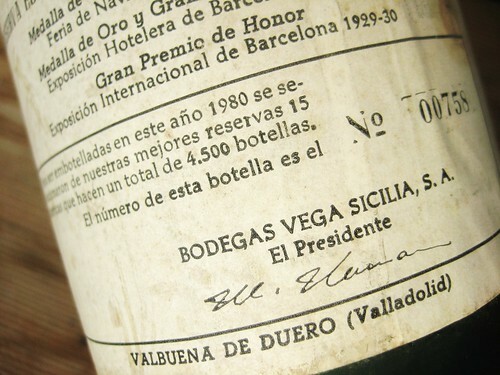 I finally realized that this is a “Reserva Especial” – In fact, truly something special since it is a composition of some of the best barrels from the vintages 1960, 1962 and 1972, and as such a very rare bottle. Only 4500 of these have been filled in 1980! Of course, having a genuine Vega Sicilia soul, it is a cuvée of the 3 varieties Tempranillo, Cabernet Sauvignon and Merlot. Finally we poured this last and thus long awaited wine. Its colour was extremely elegant -probably the brickiest brick-red I’ve ever seen. If I wanted to build a red brick house, I’d want it to have that exact same colour. I can’t deny though, that a brown hue was there on the side. But on the other hand it also had very intense brilliance: looking at this wine was fascinating already! Its nose was intense and had a delicious scent of mokka and subtle vanilla. A slight little downer on this wine was this clear glue tone that would be there, than disappear and reappear from time to time. Could this come from some bottle flaw? On the palate it showed great presence and power. Again: mokka and vanilla, but also wild cherries. Later the impression of chocolate would emerge. All of a sudden, it started to develop; it grew immensely, getting younger with each sip. Tannins reappeared and the wine gained in strength and presence. Acidity is also very present in this composure but at the same time one of the very elegant and focused kinds, putting an accent exactly where it is needed. There is no impression of unbalance whatsoever; in fact his wine seemed to be the sheer definition of harmony. I believe only great wines can show such harmony while still having good weight and flavor. And of course, only great wines can produce such a spectacular finish with a more than a minute length (at one point you stop counting the seconds and take the next sip) and showing sweet tones of malt as well as vanilla and chocolate notes and a certain freshness triggering the next sip. This wine is just impressive. I’m almost sure that if we would have given it a little more time, it would have started to show primary fruit notes. Just amazing if you consider that the oldest composants of this bottle is nearly 50 years old and the youngest nearly 40. Maybe the recurrent glue tone blocked the wine a bit, especially its fruit notes, but with respects to this aged masterpiece anything less than 95 points would be an insult. My personal subjective grade would be something like 97. By the way, Francois Audouze and his patrons had exactly the same bottle at their wine dinner recently and judged equally positive on it (in French), even though their analysis came out slightly different with emphasis on black fruit. But what a great coincidence with such a rare bottle! Wow this was such a great tasting! Honestly, the best I had this year and it wouldn’t have been possible without Oskar sacrificing some of his babies. But how hard must it be to open such bottles after you took good care of them for so many years? And also how convinced can one be that those bottles were worth being opened? Conclusively the flawless and delicious condition of those wines virtually proves 2 things. First: that great wines can age very well and second that Oskar took perfect care of his babies, keeping humidity and temperature at a constant beneficial level. One once said that there are no great aged wines but only great bottles, I must add, that there are also the great bottle keepers. So thank you so much Oskar, this was truly a monumental tasting to me- one that I’ll probably never forget. Seems like I missed a historic tasting event. Great post! Btw, which food was served to match? Ja, war einzigartig. Danke für den Link,sehr sehr interessant, aber leider war unser vega sicilia da nicht dabei. Schwer da VN zu finden scheint es.